A high security, thermally efficient and aesthetically pleasing home improvement solution. We only work with manufacturers that provide innovative and high performance products with the best materials on the market. We’re proud of our profiles by Liniar, and REHAU that use advanced technology and manufacturing techniques to provide high quality but affordable uPVC doors. With energy bills on the increase our multi-chamfered profile, patented co-extruded bubble gasket and other energy saving features mean that you can keep your home warm and comfortable all year round for less. All of our uPVC doors are designed to minimise heat transfer from the inside of your property to the outside. You will find that your uPVC doors won’t rot or warp meaning that you don’t need to worry about regular costs for upkeep or maintenance. 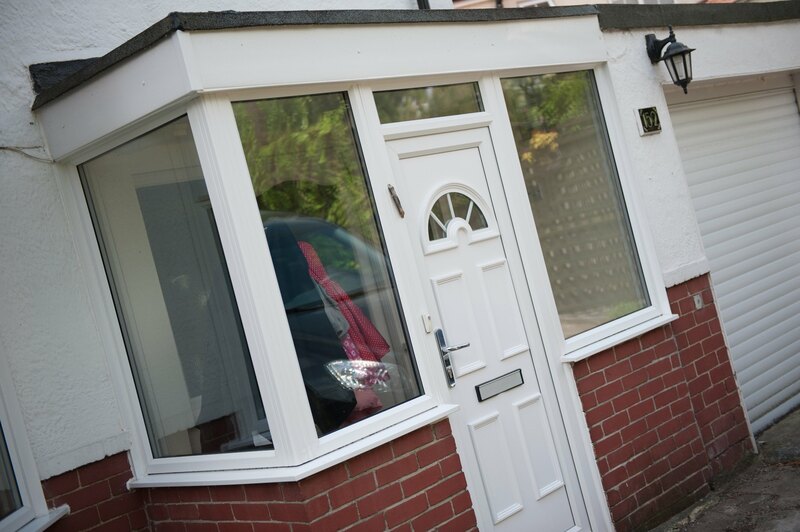 Our uPVC doors aren’t just environmentally friendly but they are preoccupied with keeping your home safe too. With high security multi-point locking as standard you can be confident that your home is safe and secure when you are out or inside your home. All of our doors undergo thorough testing to make sure they are able to withstand potential force or attempted break in. Our uPVC doors are made in the UK meaning that we can provide a quick and efficient service when it comes to providing doors for your home improvement project. All of our uPVC doors are tested thoroughly and go through extensive testing to make sure they are robust, durable and weatherproofed. We’re proud to say that our range is made from lead-free, energy efficient, recyclable uPVC which makes them a sustainable choice. We offer a 10 year guarantee against any issues that could arise including warping, splitting or cracking. We provide colour foils that we believe do not fade and we confidently offer our 10 year guarantee to our customers because of this. uPVC doors are a cost-effective home improvement option that can add value to your property and save you money in the long term. With a durable and sturdy door you can expect to enjoy your uPVC door for many years to come with very little upkeep. We can easily fit uPVC doors into any type of property, from period cottages to trendy apartments and flats. Whatever your style, we can help find a uPVC door that will fit your exact needs and requirements as well as offer additional benefits to your home. Our uPVC doors are a traditional option to adding a beautiful aesthetic as well as excellent functionality to your home. Not only do they look good but they provide excellent benefits to any homeowner that opts to have them installed. The Liniar profile is known for being the best available on the market currently as they often push the boundaries in the search for new and advanced technology for their uPVC door profiles. You can count on quality design and high performance doors for your home. Your composite doors will be installed with precision and skill to make sure that you benefit from all of the advantages that uPVC doors grant you. A professional and accurate installation is important to get the most out of your uPVC doors and to avoid any issues arising. Where a side panel is needed for a larger door area, we can offer matching side panels from our full range of doors in full and half height options. You can select the colour to match your composite door choice or a different colour frame to add impact. Design your perfect door, fully customise it to your liking and receive a free, no obligation quote in moments with our online quote engine. You can use our online contact form to get in touch about the pricing of our uPVC doors. We provide excellent prices based any requirements you have. We can provide affordable solutions for your home improvement project. Transforming your home with uPVC doors doesn’t have to put you out of pocket, we can offer solutions that are cost-effective and budget-friendly. If you would like more information about our products, our expert team can help by talking you through our range and options available to you.